LANSING, Mich. – A Fenton man is looking forward to a financial cushion after winning a $4.4 million jackpot from the Michigan Lottery. The player, who chose to remain anonymous, matched all six Lotto 47 numbers drawn May 17: 09-13-17-24-30-33. He bought his winning ticket at Smitty’s Exit 80, located at 2461 North Road in Fenton. He visited Lottery headquarters Wednesday to claim the jackpot. 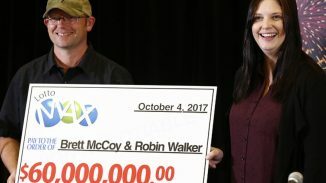 He chose to receive his prize as a one-time lump sum payment of about $2.8 million rather than an annuity. With his winnings, he plans to set up college funds for his children and then invest the remainder in his retirement. “It feels great to have a cushion and know I’ll be able to retire on my terms,” he said.